A warriors first concern in armor should be protection, and this breastplate delivers on that. Style comes second, although in the case of this Broderic Breastplate with Pauldrons, style is intrinsic thanks to its masterful design. Made from high quality 9-10 oz. leather, this breastplate is an ideal suit of armor for any warrior to wear, whether they are marching into a mock battle with friends, a full-out LARP conflict, or even a fair or convention where they are just showing off how good they look in their warrior gear. The breastplate consists of a simple underplate, onto which has been riveted several individually cut leather plates, all distinctively spaced and styled. The effect of this unique design is that the breastplate not only looks like an impressively styled work of art, but that it also has the layers necessary for impressive defense. The Broderic Breastplate with Pauldrons also includes a pair of leather shoulder protectors, which echo the design of the breastplate. These pauldrons cover the tops and sides of the shoulders, while leaving the arms free to move. They are connected to the breastplate via grommets and ties found on both the pauldron and on the breastplates shoulder strap. It is available in four sizes, and each size also features four leather straps with two around the lower back and one over each shoulder that not only ensure the breastplate has a comfortable, secure fit, but also give each size a measure of adjustability. As such, you should always order your armor in the size that closest matches your own and then adjust to comfort once you receive it. The armor also comes in three different colors, all brown, all black, or black and brown. 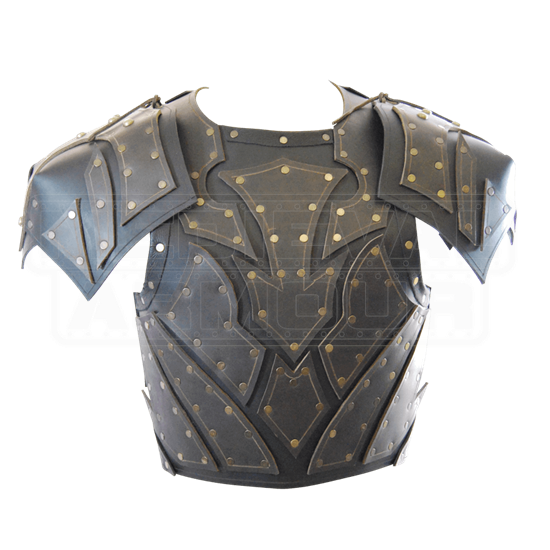 In your Broderic Breastplate with Pauldrons, you will certainly look the part of a skilled warrior who is ready to march into battle. In this impressive armor, you will feel ready to do so, too, because you know that the armor will keep you safe, while possibly giving your potential opponents pause, either because they are admiring your armor or because they are hesitant to approach what looks like a real hero of medieval myth.